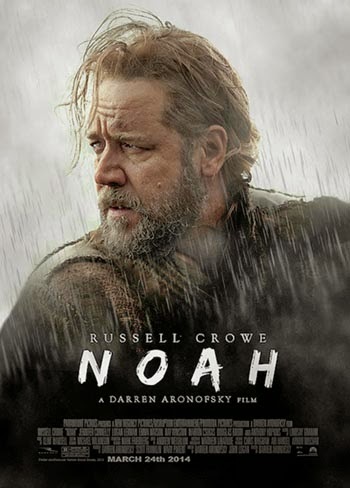 Home » Bible » Book of Enoch » Book of Genesis » Darren Aronofsky » Eric Cline » Genesis » Hebrew Bible » Noah » Old Testament » Russell Crowe » Review: "Noah"
This might be a little late for a review on Noah, but the last weeks had been busy. Anyway, here we go. Overall, the movie is entertaining, but not memorable. I have heard several colleagues talk about the movie and some liked it and some others did not care much for it. Some found it “provocative” some considered it “long and tedious” and not compelling. I went to see it without any expectations that the film will be faithful to the biblical account and it was very helpful, because I did not feel any disappointment as some of my friends did. The Genesis account is reflected in the movie although not strongly; it follows the story's chronology and some of the account’s circumstances. I’m not entering into details this time, but parts of the Book of Enoch, some midrashim and elements of the ANE flood accounts are also echoed there. I listened and strangely enjoyed the recent Friends of ASOR’s podcasts where doctors Marvin Sweeny, Eric Cline and Robert Cargill gave their opinions about the movie. Here I offer a summary of their comments on Noah while giving my some of my own thoughts. Dr. Sweeny left before the movie was over. I found that funny and not surprising. He felt, as expected, the movie is not close to the biblical text. He didn't find it particularly coherent, but rather a gathering of what the producers decided to pursue. I agree with Dr. Sweeny it was not a good characterization of Noah. But Dr. Sweeny is a better fan of Russell Crowe personifying justice and righteousness than I am. He thought that Noah would be more of a rebel than he was because for him Noah’s character seemed to obey “the Creator” without questioning, “even to the point of forfeiting the future of his family.” Well, I am not sure Noah was following the Creator directives blindly. He only had few experiences with the Creator and none of them was clear as to discern what he wanted, which to me, exacerbated Noah’s confusion and helplessness. He was more on his own rather than being a fanatic. Dr. Sweeny also mentions that Noah has a theological problem since “he never refers to God, but refers to the Creator.” Noah may have a theological problem, but it is concerning his idea of who the Creator is and how is his relationship with him more than calling him by a particular name. Besides, as we know, the Scriptures don’t portray God revealing his name until he meets with Moses (Exod 3: 13-14). On the question if Christians and Jews should go and see the movie, Sweeny said, yes and no. He finds the movie (and me too, especially at the beginning) tedious, preachy and moralistic. The movie has an environmental agenda, especially against the “meat eaters”. Now, I can understand that there was no YHWH’s command to eat meat until after the flood (Gen 9:3), but seriously, evil in the world is condemned because people eat meat? It’s a bit too much of a stretch. Dr. Eric Cline had not seen the movie at the time he was asked for a review. I liked he said that, because I have become aware many of my students and colleagues presuppose that because some of us study the Bible more closely we are expected to be on top of everything that the bible is related to: tall call here. I enjoyed very much his comment on how there is so much money spent in expeditions every year for the last two decades looking for the ark, and in carbon dating “pre-historic monumental wood that turns out to be a couple hundred years old." My favorite comment on this issue is that Dr. Cline would not be looking for the ark, but rather for Noah’s house after the flood. It would make more sense. The comment was funny too. Dr. Robert Cargill is another of Noah’s reviewers; no surprise there. As a difference from Sweeny and Cline, he loved the movie. No surprise there either. Dr. Cargill professes himself as very skeptical, but he seems to like very much Aronofski and his crew. Again: he loved the movie. He also feels that the producers did a great job interpreting Noah and also that the movie was well acted. In answering further questions, Cargill discusses the possible movie’s audience. He thinks of those who read the Bible fanatically, that is the conservatives, and those who are progressive, that is, who read the Bible thematically and make applications of their reading to their daily lives. The conservatives, says Cargill, try to force society back to the Bible while the progressive take what they can from their reading. He feels that in Noah, Aronofski takes different biblical themes like the Akedah, Job, the Exile, and somehow portrays them in the movie. Suffering, sacrifice, self-denial, hope in the middle of tragedy or uncertainty are reflected all over the Bible and other religious literature. I agree with Cargill that the flood myth has been reinterpreted and retold in this movie, however, it is too much to say, for example, that the Akedah (Gen 22) is clearly reflected in the movie when Noah raises the knife to kill his two granddaughters. Then, as a friend of mine said, every time we see a knife raised in the Bible is a reference to the Akedah. Dr. Cargill is entitled to his opinion, but I find the references he sees clearly as vague and overextended. I found Noah’s character so broken, he was not even capable to see the sign of love and hope the Creator was giving him in his relationship with his family. He was never there to see, to listen, what his family had to offer him. He blamed his wife for trying to save the family. He never paid attention to his son Ham’s feelings and needs. For me the most dramatic part was when, exhausted and angry by his father’s guilty depression and his constant drunkenness, he departs for good after seeing his pathetic father naked. Noah had all the love and help could need just in front of him, but he never was capable to identify or connect with anyone, and it was not because he had to do the Creator’s bidding, it was because he never found himself capable of relating with anyone in a deeper way.